Pin It Just after returning from Denver, we spur of the moment decided to drive to Concord for a long weekend. Brice's brothers were all still in town so the five of us went mini-golfing. 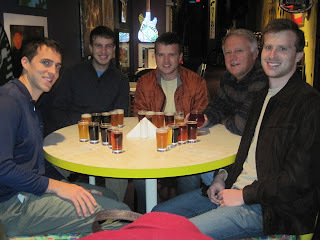 I joined the four of them and their dad at a beer tasting downtown (no beer for me). We also played a game of Bezzer Wizzer here and there during the visit. I got a coffee visit with Heather and Jessica on Friday morning. Heather couldn't stay long, she was headed out of town that day for work and then back home after visiting her family and in-laws for Christmas. 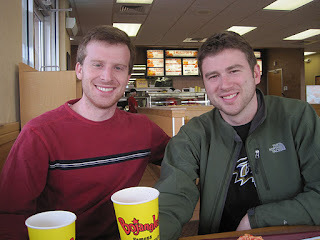 On my way home, I got to stop for some Bojanlges' that I never get here in my new home. I met up with Jess and her mom later for some shopping at Southpark mall and then we went to a Greek restaurant. It was all sooo good. I went back to her mom's and we all watched an episode of Gilmore Girls, just like that old days. I spent Saturday with my parents and accompanied them to War Horse. I know it's nominated for some awards, but personally, I thought it was sort of slow at the beginning. Jessica came over to ring in the new year with us that night and we had another game of Bezzer Wizzer and some champagne.